In the late 1830's and early 40's, German immigrants found their way down the Ohio River and into the Whitewater Valley. Here they found an area which appealed to them, and it was here that they settled. Into this frontier country they brought their language, their customs, and their religion. Although Brookville had been founded as a town in 1808 there was no Lutheran Church, and those Protestant churches which had been established used only English in their services, a language which many of these settlers failed to understand. Naturally these people sought to organize a congregation of their faith, with the service to be conducted in their native tongue. Occasional services were held in the Market House, (Fifth and Main), in homes, and in the Presbyterian Church. These services were conducted by ministers coming from Cincinnati, Hamilton, or Klemme's Corner where a congregation had been organized in 1838. These opportunities for worship were very irregular and did not fill the needs of the new settlers. 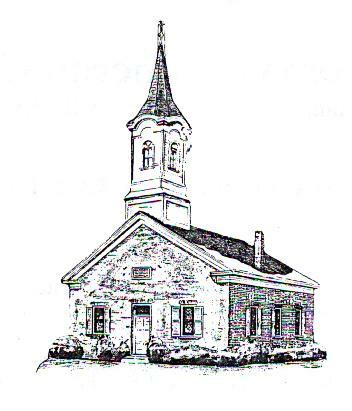 Thus it was that St. Thomas Old Orthodox Lutheran Church, also known as German Evangelical Church of Brookville, came into being with a formal organization July 6, 1848. Financially unable to build a church structure, they obtained on July 15, 1848, an undivided one-half interest in what was known as the Brick Church in the Cemetery. This was owned and used by the Presbyterians who were in the process of raising money for a new church edifice. On September 17, on that year, it was dedicated as a Lutheran Church by Rev. Alvis Anker, assisted by a Rev. Porter of Cincinnati. This church was used jointly with the Presbyterians until June 21, 1852, when the new Presbyterian Church near Sixth and Main was completed. It was then that St. Thomas purchased the remaining undivided one-half. This building, purchased at a cost of $700.00 had been built by the Methodists in 1821, who in turn sold it to the Presbyterians in August 1840. It continued to serve as a Lutheran Church until 1924 when the present church at Ninth and Franklin was completed. The first members of the new congregation included the following: George Ulrich, Ernest Dantrich, Conrad Metzger, George Wiedner, George Stang, John Rumple, Daniel Starkel, Louis Federmann, Fred Schreiber, Gotlief Kiesler, John Henrici, John Herrick, Jacob Knerr, George Schlapp, Daniel Davening, Peter Spitzfaden, Zachariach and Adam Fogel, the Finks, Ritzis, and a number of others whose names cannot be ascertained. Evidently Rev. Anker was filled with a missionary zeal, for he remained here for but one year and then went on to assist in establishing other new congregations. He was succeeded by Rev. Dr. Herman Blecken, a man who was both a physician and a minister. He served the congregation and the community from 1849 to 1851. The next pastor was Rev. Henry Cordier, a minister and an educator. It was under his direction that a parochial school was established for Lutheran and Catholic children. This school was taught in German and was located on the canal bank to the rear of what is today the Lea building, 328 Main Street. Little is known or revealed of the school in the records, but it probably remained in existance until he left here in 1856. However, he must have been quite successful for German was really the primary language for many families, a fact which is noted in the history and the customs of the community at that time and for many years afterward. In addition to founding the school, he also instructed and confirmed the first catechetical class for St. Thomas. Members of this class are listed as follows: Thomas Stang, John G. Stang, William Vogle, Fred Starkel, Fred Ulrich, Martin Baxner, William Ellerman, Christian Hofer, Christina Hofer, Christina Reidenbach, Marie Nestheimer, Marie Grimme, Anna Ellerman, Louisa Veith, Louisa Schmerle, and Maria Muller. Following Rev. Cordier came the Reverands Kuch (1856-57) Tumler (1857-60) , Richter (1860-61) , Arnold (1861-64) , Kiesel (1864) , Nestman (1864-67) , and Thomas (1868-70). Very little of the church history of these years is known, for during the tenure of Rev. C. C. Thomas a fire destroyed the records of the church. He wrote in the new records as much as he could remember but much, which would be of interest to the historian of today, was forever lost. Evidently during the time that Rev. Thomas was pastor, St. Thomas Church gained in strength. Prior to that time many of the ministers had lived elsewhere and served other churches such as those at Klemme's Corner and Peppertown. At this time the church purchased their first organ, and also the first parsonage. Prior to this time a tuning fork had been used to start the singing. The exact location of the parsonage purchased at that time is unknown, although the writer has been informed that it was on Franklin Avenue and was standing as late as 1923. In 1870, the Rev. 0. G. Heinish became pastor and it was during his pastorate that the church was remodeled and the belfry or tower was added. The bell up to this time, hung from a crossbar extending between two trees. It was also at this time that the name of the congregation was changed from Old Orthodox Lutheran to Evangelical Protestant Lutheran. The plaque, still intact, on the old church, reads "Deutsch Ver. Evan. Protestansque St. Thomas Kirque". He left here in 1872 and was followed by Rev. Gustave Borchert who served from 1872 to 1876. During 1876 two other ministers officiated in addition to Borchert - a Rev. Boersch and a Rev. Luesche; each serving but a few months. Late in 1876, Rev. Joseph Schmatzel became the pastor and continued to serve until his death in 1885, a period of nine years, the longest period of any minister to that time. He also served the churches at Peppertown and Klemme's Corner. During this time funds were collected for a new organ, the old organ sold, and a new one purchased. This instrument was to serve the congregation for many years, in fact until they were to move forever from the old building. Following Schmatzel's death, Rev. C. A. J. Cramer became pastor. He continued to serve until 1888. It was during this period that the old church was remodeled again. This time a new floor, new seats, new doors, and stained glass windows were added.. In spite of the impression created by these constant improvements, the congregation was not strong financially; a fact which probably accounts for the fact that the congregation had so many different pastors during the short space of years. The records show that Rev. Cramer received but $665.00 from the St. Thomas congregation during his three year tenure. However, during this time he also served the church at Klemme's Corner and between the two churches he was able to Survive financially. During the next few years the church was served by a number of pastors. From 1889 to'91, Rev. C. C. Wagner was the pastor. He was followed by Rev. Paul Schmidt, a pastor who is even today fondly remembered by some of the older members of the Parish. He served from 1891 to'95. In 1895 Rev. Wellhausen became the pastor, and in 1897 Rev. Gustav Michelmann arrived to remain here until 1900. While here, Rev. Michelmann became the third pastor to marry a Brookville girl. He married Mizz Lizzie Klemme. Others who had married while here were Rev. Cordier who married a Miss Hertel and Rev. Wagoner, who married Mary Kiesler. In 1900 a Rev. Gilbert became the pastor and although he only remained here for three years it was a period of active growth. For some reason, not disclosed by the records, the congregation had disposed of their first parsonage and had been considering erection of a new one. There seems to have been a discussion of a location with some favoring one location and others still another. In 1902, the opportunity came and a parsonage was built on John Street. This area was a corn field and was owned by Peter Schiltz. Mr.Schiltz wanted to develop the area into what would be called today, a sub-division. In order to get a start he not only sold the lot but built the house for the congregation at a cost of slightly over $600.00. This home continued as the parsonage until 1962 when it was sold and a new home built. Through the years many improvements were made to the structure but investigation shows that a number of the pastors were not married and did not use the home and in at least one instance, Rev. Schatz, commuted between Braokville and Cincinnati, remaining here only over the weekends. During these years the parsonage was rented to others. The building of the parsonage at this location must have proved an incentive to others for the remaining lots were soon sold and the area from John Street to Fairfield Avenue and from 11th to 12th Streets soon grew into one of the best home locations in Brookville. Following Rev. Gilbert came Rev. S. H. Lutz who remained here until 1905. He was followed by Rev. Joseph L. Schatz who served until 1912. At the risk of getting too far off the subject at hand, the update author feels some comment on Bob Bunz is appropriate. Having known him many years I became aware of his many talents. He had a short career in the the U. S. Navy during and shortly after WWII. He was a long time teacher at Brookville High School. His classroom discipline was legendary. I personally did not have him as a teacher, but I have heard stories of students who felt they should test his will with some sort of disruption. It is said Bob would then come up behind this student and slowly dig his "pincer-like" fingers into the shoulder blades of the offender. It is said there were no repeat offenders. Bob did not waste his summer vacation from school. For many years he managed swimming facilities and taught swimming, first at Versailles State Park and later at Heap Memorial Pool in Brookville when it opened. He was an unusually strong swimmer, and if you had him as an instructor, you had the best. He was fiercely loyal to any organization he associated with, and his opinions were strong; consequently he had very little patience with dissenters. Bob Bunz died November 13, 1983 and was laid to eternal rest on November 16 at the age of 79. We greatly miss him in our midst.